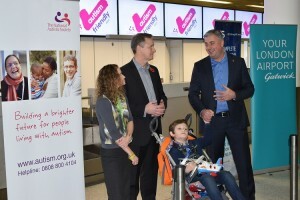 Gatwick has become the UK’s first Autism Friendly airport in recognition of the airport’s commitment to becoming an accessible and friendly environment for autistic passengers. More than 1 in 100 people in the UK are autistic. The National Autistic Society’s Autism Friendly Award recognises organisations who commit to making sure that autistic visitors receive the same warm welcome as everybody else. “Autistic people and their families want to access the same opportunities others often take for granted, and this includes holidays and travel. But many rely on routines to make sense of an often confusing world and can find the busy and unpredictable airport and flight environment distressing and disorientating. “So we are delighted that Gatwick Airport has put so much effort into improving this situation and have achieved our prestigious Autism Friendly Award. What particularly impressed us is the care they continue to take to incorporate the feedback of autistic people and their families to help improve the service they offer to them and other customers with hidden disabilities. Helpful guidance and information specific to the needs of autistic travellers is available on their website and Gatwick staff will receive our autism training. This means that at every stage of the flight process, from check-in to boarding, staff will be aware of autism and will be able to offer appropriate support and advice. “We recognise airports can sometimes be a stressful environment for autistic passengers, but that simple steps can go a long way in helping to break down barriers and make it easier for autistic passengers and their families or caregivers to travel through Gatwick. “For passengers with hidden disabilities, which includes autism, the thought of travelling through a busy airport can be stressful and confusing, and knowing you will also have to go through security checks, can add an even greater level of anxiety. “I have been amazed by the care and commitment of those involved in helping to make Gatwick Autism Friendly who are passionate and motivated about making a real difference.